Nothing makes a summer’s afternoon special quite like a little treat. We think summer deserves a menu that’s just as enjoyable as the season itself. So that’s exactly what we have created. ​Order our Summertime Selection Pack of 7 mains and 4 desserts for £36.99 and we’ll include a FREE* Cream Tea (worth £3.65) to enjoy at your leisure. The pack contains 3 brand new summer meals including Brisket Steak in Diane Sauce and Lamb with Redcurrant and Red Wine Sauce as well as our Lemon Profiteroles and Raspberry Panna Cotta - back for a limited time only. This offer won’t be around for long so if you’re tempted, order yours today. 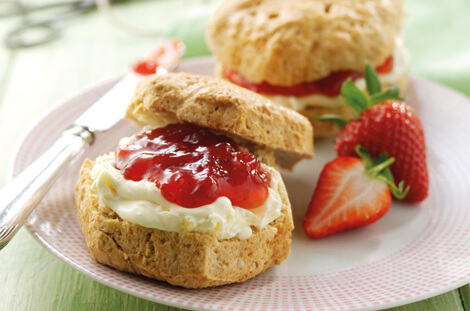 Order our Summertime Selection Pack and we’ll treat you to a FREE* Cream Tea. With 7 mains and 4 desserts, you’ve all the ingredients for a perfect summer. If you prefer to make your own choices and order individual meals, simply browse our Summer Menu and see what takes your fancy. From our delicious new BBQ Pulled Pork to our cool, refreshing Strawberry Sundae, you’ll find all the meals you need to make enjoying summer a breeze. The only difficult decision now is what to choose – we’ll leave it to you! order from 4th June until 19th August 2018 or while stocks last. Minimum order in some areas.